Sadly, a little over a year ago, one of our original pair passed away but Leica is still here and the other day saw her fourteenth birthday. 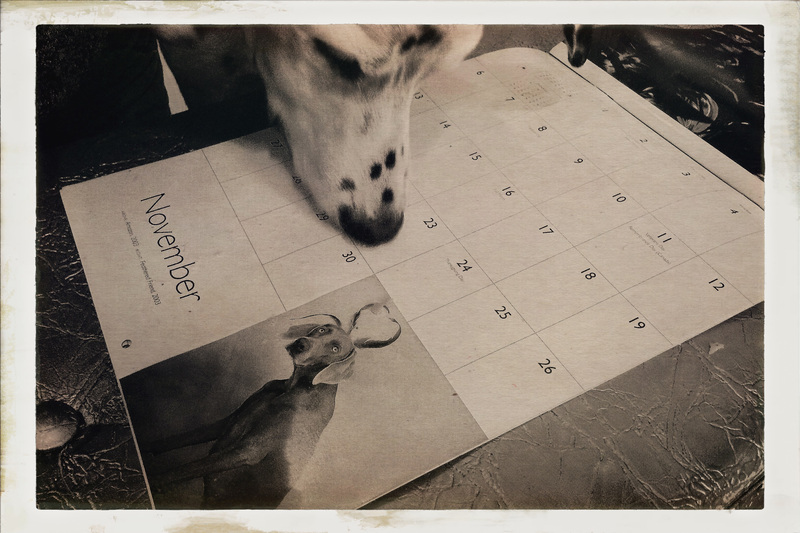 Here she is, checking out a William Wegman calendar featuring one of his dogs, “Fay Ray” who as it happens, shared the same November birthday. Wegman and I share the same birthday too coincidentally, albeit separated by a few years. Fay, like Wegman’s other dog “Man Ray” is long since gone but their lives were recorded and remembered in books, calendars, short films and exhibitions. Photography and photographs have always been associated, by their very nature, with things past. Sometimes the real value in a photograph is not directly related to any aesthetic quality it might have, sometimes it simply serves as a reminder of someone, some thing, or some place we feel we want to remember.